Barium - 56Ba Your user agent does not support the HTML5 Audio element. Barium isotopes are used in a wide variety of fields and applications. Ba-130 is used in the production of Ba-131/Cs-131 which is used in brachytherapy (seeds). Ba-132 can be used for the production of Ba-133 which is used as a gamma reference source. Ba-134 has been used to perform experiments in the field of nuclear physics. Ba-136 has been used to study photon scattering phenomena. Both Ba-136 and Ba-138 have been used in activation cross section experiments. Ba-135 has been used to validate the use of spinor symmetry while Ba-137 has been used in experiments regarding the theory of relativistic coupled clusters. Finally, Ba-138 has been used in studying so-called r- and s-processes in stars. This table shows information about naturally occuring isotopes, their atomic masses, their natural abundances, their nuclear spins, and their magnetic moments. Further data for radioisotopes (radioactive isotopes) of barium are listed (including any which occur naturally) below. 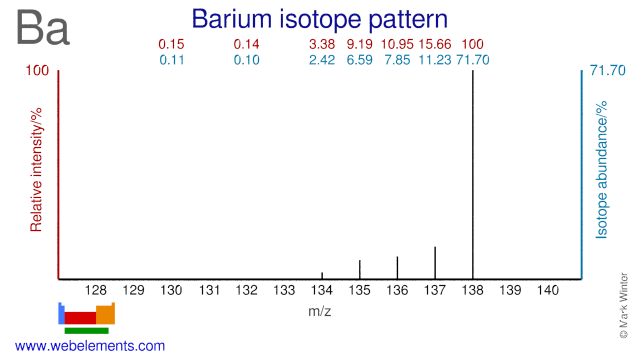 Isotope abundances of barium. In the above, the most intense ion is set to 100% since this corresponds best to the output from a mass spectrometer. This is not to be confused with the relative percentage isotope abundances which totals 100% for all the naturally occurring isotopes. Further data for naturally occuring isotopes of barium are listed above. This table gives information about some radiosotopes of barium, their masses, their half-lives, their modes of decay, their nuclear spins, and their nuclear magnetic moments.